DHTMLX Scheduler .NET for ASP.NET is a highly customizable Ajax-powered calendar control that allows quick adding of a user-friendly scheduling interface, similar to MS Outlook or Google Calendar, to your ASP.NET apps. 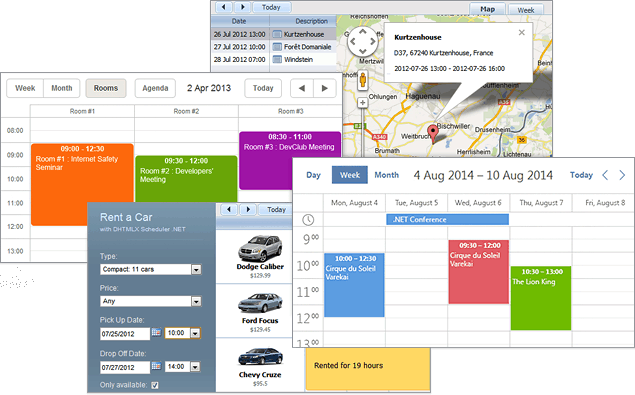 It allows creating rich web event calendars, task managers, job schedulers, booking calendars and car rentals. The recent update allows creating calendars with flexible time scales, limited display of events in the month view, multi-day view with overnight events, improved recurring events, default 'terrace' skin, better API. The web control can also be easily integrated with the jQuery and Backbone libraries. Other features include: main features include convenient drag-and-drop, multiple views (day/week/month/year/agenda/timeline/grid/multi-day/multiple resource), flexible time scales, hiding time units, touch screen support, live update, recurring events functionality, jQuery validation of user inputs, time zone conversion, and many more. Integration with Google Maps provides map display of your event location as well as choosing the required location right on the map. With Scheduler .NET you can export data to PDF/iCal/Outlook and Google Calendar. Multi-page export is available. Quick navigation through days, months and years is possible due to the date-picker (popup or placed next to the calendar). You can use tooltips to display event details when you hover over an event without opening an event detail form. You can use three skins - modern glossy, classic and terrace; or use an online skin builder to customize the colors of the modern and classic skins. The event calendar interface can be localized to 25+ languages. Ready samples in MVC3/MVC4 Razor, VB.NET and ASP.NET are available. DHTMLX Scheduler.NET is distributed under Commercial/Enterprise license. Scheduler Standard and Scheduler PRO Editions are available. Scheduler PRO allows creating multiple schedulers on a page. Free trial period is 30 days. Statement: First, please download the orginal installation package by clicking the download link. Of course you may also download it from the publisher's website. Using DHTMLX Scheduler .NET crack, key, patch, serial number, registration code, keygen is illegal. The download file hosted at publisher website. We do not provide any download link points to Rapidshare, Hotfile, Depositfiles, Mediafire, Filefactory, etc. or obtained from file sharing programs such as Limewire, Kazaa, Imesh, Ares, BearShare, BitTorrent, WinMX etc. Software piracy is theft. If you like DHTMLX Scheduler .NET please buy it.